A little while ago, I bought myself a cold smoker, or more specifically, a ProQ Cold Smoke Generator. It’s quite an ingenious little device, and consists of a spiral channel which is filled with fine wood chips. Once lit, the wood chips slowly smoulder away, burning along the spiral path, generating the smoke as it goes. I’ve been eager to try it out, but summer kept hanging on, and it was best to wait for the temperatures to drop a little and for autumn to settle in properly. The temperature has finally started to drop and so I felt it was now time. But what should be the target of my inaugural smoke? Well, it didn’t take too much thought. It just had to be smoked salmon. I’d never done this before, and had no idea how this would work out, so for this first trial run, I decided I’d start relatively small and bought a medium sized salmon fillet. Before you start, you must weigh the salmon – it will lose weight during the process, and you’re aiming for around an 18% loss in weight by the end. My piece was a mere 282g. First, you need to soak the fish in brine. I used a 20% solution (200g salt in 1 litre of water) and soaked for four hours in the fridge. You need to keep all of the fish submerged during this period, so I weighted it down with a small dish. The next stage is drying. I removed the salmon from the brine and laid it flat on a rack, on top of a tray to catch the drips. I then placed this in the fridge, and left it for 24 hours. Now it’s time for the smoking. You need an enclosed box to contain the smoke, with somewhere to put your food while it smokes. 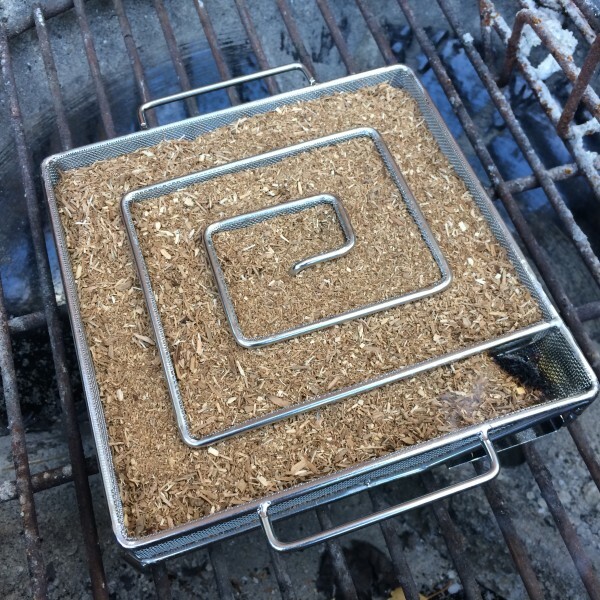 A kettle barbecue is perfect – you place the smoker where the coals would normally go, and then lay the food to be smoked on the main barbecue rack. So, I filled the smoker with the oak wood dust provided, placed it in the barbecue and lit it. The salmon went on the rack above the smoker, and I placed the lid on the barbecue and waited. The barbecue quickly filled with smoke – I peeked a few times just to check it was all working. 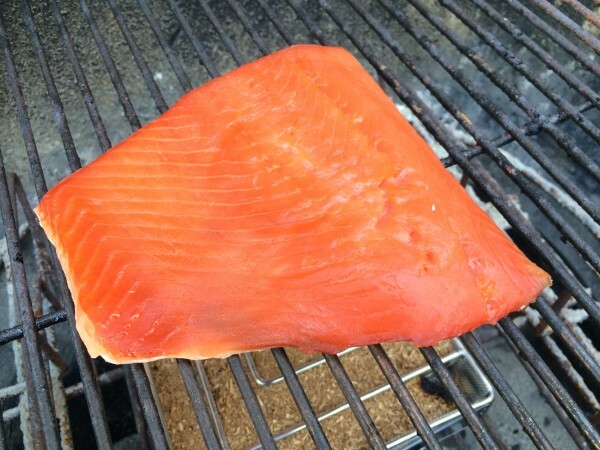 The smoker claims to burn for ten hours, which sounded about right for the piece of salmon I had. In practice, it lasted for a little over eleven hours before burning out. At this point, I weighed the salmon again – I was aiming for 18% weight loss, but mine was just short of 17%. I figured that was good enough – it wasn’t a large piece of salmon, I didn’t expect it was going to last very long. 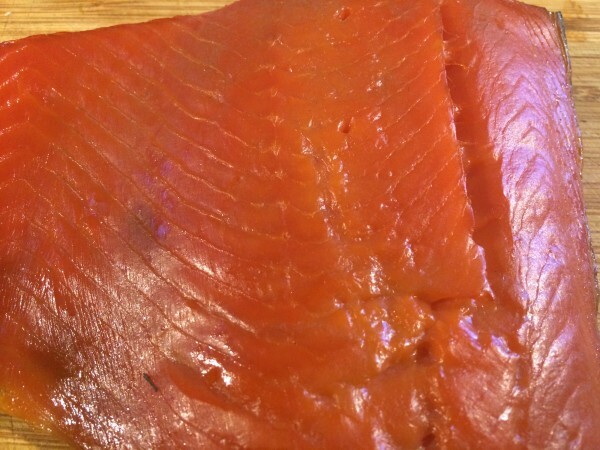 After smoking, the salmon needs to rest for a while for the flavours to mingle properly throughout the fish, so I brought it back indoors, wrapped it gently in cling-film and placed it in the fridge overnight. The next day, I sampled the salmon. I sliced it as thinly as I could and tried a piece. It was delicious – a beautiful smoky flavour, but not overpowering. I’m undoubtedly a little biased, but I’d say it was one of the nicest smoked salmons I’ve ever tried. I was right though, it didn’t last long. Next time I’m clearly going to have to try a rather larger piece. I imagine a larger fillet would require a longer smoke – mine was probably only just done at the thickest point. So, overall verdict – delicious. I definitely plan to have a large slab of this ready for the Christmas holiday. For a first trial run of the smoker, I was very pleased with everything, it was incredibly easy to use, and the results were fabulous. I’d thoroughly recommend one of these for anyone interested in experimenting with smoking. They’re available from Sous Chef, along with a variety of different wood dusts.